I have two basic approaches when it comes to reviews. If the album is by a band whose discography I am familiar with, I’ll read the PR materials to learn more prior to listening.1 If it’s a band I haven’t heard of, but either grabbed off the promo list or was voluntold to take it by the inestimable Madam X, I won’t read anything about the band. I’ll dive right into the promo and form some unfettered opinions over a few listens before checking out the PR material. That’s how I did it with Belgian quartet Fire Down Below and their sophomore album, Hymn of the Cosmic Man. The genre was “Progressive Rock” but the label was stoner/sludge mavens Ripple Music, so that left a lot of room for interpretation. Could they be sludgy prog? I’d be up for that. The first few listens of this impressive album gave me the answer, and it was a resounding “Yes.” Essentially, Fire Down Below sound like a very tasty blend of Kyuss and Tool, with a bit of Audioslave thrown in for good measure. If that doesn’t appeal to you, go read about black metal. If it does, I’ve got a few hundred words of praise coming up, right after we get past the short, majestically doomy intro track “Red Giant.” It doesn’t really fit in with the rest of the album, but it sets things up nicely regarding the concept, which is, loosely speaking, about a man taking off into space. 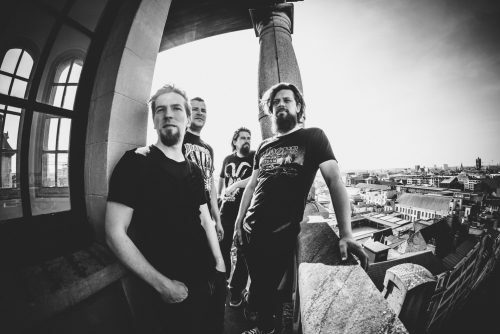 “Red Giant” fades out in a wash of feedback, directly into the first killer track, “Ignition/Space Cruiser.” The first half of the song (“Ignition,” I suppose) is a reworking of “Green Machine,” from the riffing to Jeroen Van Troyen’s Garcia-like sneer. It’s a high energy burner until our hero gets clear of the atmosphere, when the song transitions to a mid-paced, groovy as hell number with yet another great riff. You can almost sense the wonder on the astronaut’s face as he floats out into space. “Saviour of Man” is the only short song on Hymn of the Cosmic Man that isn’t an intro or interlude, a fun little rocker with a couple of driving riffs. You might not get the hint yet, but this album is loaded with riffs, each one catchier than the last. “The Cosmic Pilgrim” is simply massive, letting up in the middle with a bit of Tool-like atmospherics (these come into play several times throughout the album). I want to say the closing songs “Ascension” and “Adrift in a Sea of Stars” are highlights of the album, both elaborately-arranged works of interstellar psychedelic prog, the former featuring excellent psychedelic riffs and the latter a churning epic, but I can’t: this is a record where whichever song I’m listening to seems to be the best one. I haven’t been amazed at how consistently great most of a sophomore album is since Karnivool’s Sound Awake graced my ears nine years ago. Aside from the fact that the obligatory loud mastering job takes away the attack of the drum kit, Hymn of the Cosmic Man sounds great, especially the bottom end. The bass resonates to a satisfyingly deep level throughout, thick and fat when underpinning the riffs, percussive and cutting like a piano when complementing them. Van Troyen’s voice tops the mix, as it should: the man makes use of the sneer of John Garcia, the croon of Maynard James Keenan, and the melodic sensibilities of Chris Cornell throughout. And of course the riffs are central to each well-arranged number, dominating the songs’ structures. Compelling arrangements don’t come naturally to many bands, but Fire Down Below has mastered the process here. Not often am I compelled to check an obscure band’s back catalog, but in this case I had to. 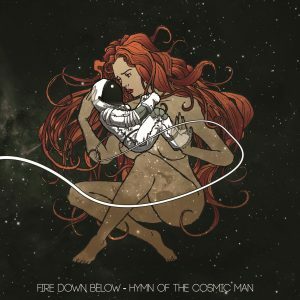 Viper Vixen Goddess Saint was Fire Down Below’s last album, released in 2016, and while it shows hints of what was to come, if I were reviewing it here it might be a 2.5. The band has progressed light years beyond their debut here, with the catchiest, most riff-laden album I’ve heard so far; an album that has easily landed in my mid-year Top Ten list. If you like your prog psyched up, and your stoner rock proggy, this is your album.